Dr. David Call, Associate Professor in the Department of Geography at Ball State University, teaches a class called “Earth, Sea, and Sky: A Geographic View.” In the class, students learn about selected aspects of the physical environment and their relationship to human occupancy of the earth. Each year, the final project for the students in the class involves learning about the effects of flooding on various environments around the United States. Dr. 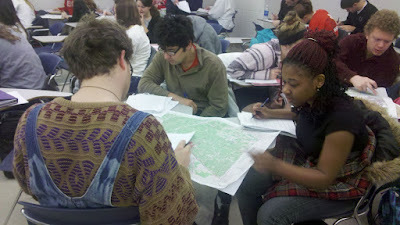 Call uses U.S. Geological Survey topographic maps from the Libraries’ GIS Research and Map Collection (GRMC) to show students how these environmental factors are depicted graphically on the maps. Students use maps of New Orleans and Laplace, Louisiana, Chester, Illinois, and Natchez and Valley, Mississippi to study how the changing course of rivers affect state boundaries and land claims. Students examine how New Orleans’ low elevation affects different parts of the city and how river deltas can be an excellent resource for fossil fuels. Dr. Call also uses topographic maps from the GRMC for an assignment about cities in relation to rivers and mountains and the evolution of transportation. The GRMC provides maps for professors, teachers, and students for presentations, classroom projects, and other learning activities. Maps from the GRMC can be used for these special projects for the entire semester if necessary. And maps from the GRMC can be provided in digital format for teachers and professors around the world. 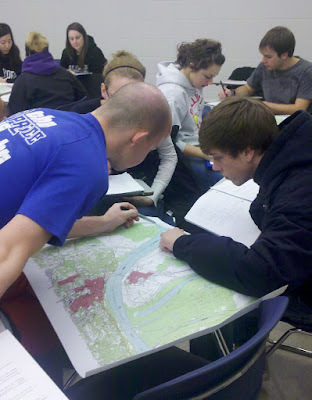 Please contact the GRMC at 765-285-1097 Monday through Friday to find out more about using maps in the classroom.